Thicken your hair quickly with Nexgen. Nexgen Hair Thickening Fiber, also known as Nexgen Hair Building Fibers, is a cosmetic option to temporarily increase hair volume. People with thinning hair concerns or a desire to increase hair volume for a certain hair style can both benefit from this hair enhancement tool. A more affordable and less invasive alternative to expensive hair replacement or extension procedures. Hair fibers can be shampooed out of hair whenever desired. Fiber thickeners are often compatible with other hair loss treatments. Hair thickening fibers are more realistic than spray-on hair concealers. Products like Nexgen make it possible for people with thinning hair or bald spots to increase their hair thickness with ease. People who choose to use hair fibers can achieve natural-looking hair styles without the use of hair pieces. The fibers can also blend naturally into a hair transplant during the recovery process to hide scabs or any post-operative thinning. Nexgen fibers are also a versatile styling tool for people who want to temporarily add thickness to a hair style. People can use the fibers to style funky layered hair dos or give an edge to a punk hair style. Fiber colors can be mixed to create a unique look. Nexgen Hair Building Fibers is a hair loss concealer product that provides natural keratin fibers that cosmetically enhance thinning hair to make it appear thicker. Produced by Actus Technology Co., Ltd. of China, Nexgen is one of the leading hair thickening fiber products on the market. Natural Appearance: The fibers look more natural than spray-on hair products because they bond to the existing hair to create a realistic fullness and shine. Weather Resistant: The hair fibers bond securely to the hair and can sustain normal weather conditions such as rain and wind. Hair Styling Ease: Nexgen fibers can be incorporated into most hair styles and stay in place. Easy to Remove: The product washes out of the hair easily with a mild shampoo. No special removal product is necessary. Compatibility: Nexgen fibers are safe to use with most other hair loss treatments such as propecia and minoxidil. Safe: The natural material is safe, non-toxic, and gentle enough to use on sensitive scalps. Affordable: Nexgen hair fibers are more affordable than other top hair thickening fiber products. Each bottle contains a 60 day supply of hair fibers with normal usage. Large Color Selection: Fibers colors match most hair colors. Colors include black, brown, medium brown, light brown, and blond. Color Stays on Hair: The product does not rub off or drip onto skin or clothes. Nexgen Hair Building Fibers are laser-cut natural keratin protein fibers that bond to existing hair to create the look and feel of thicker hair. 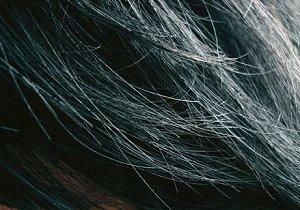 The fibers bond securely to both normal and thin areas of hair. In bald spots, the fibers bond to thin vellus hairs and hair near the affected area to mask the signs of balding. Nexgen claims that the fibers are electrically charged which allows them to stay bonded to hair all day and gives the appearance of more hair volume and density. The fibers also blend into the hair without any visible demarcation lines. Nexgen Hair Thickening Fibers are easy to use and take less than ten minutes of styling time. The fibers are designed to work on dry hair. Wash your hair and dry it. Air dry or blow dry hair. Freshly washed hair will have more body. Air drying is recommended because it is gentler to the hair and scalp. Comb your hair and identify the thin areas to be treated. Apply the Nexgen fibers to the affected area using a shaking motion. Gently brush or comb the treated area to get the fibers to blend into the rest of your hair. Style your hair as desired. Fibers blend in realistically with the hair. Hair fibers stay in place well. Color choices match hair naturally. The application process is faster and neater than other brands. Fibers do not stay bonded to hair. Product left flakes on face and in the hair. No color choice for red hair. The blond version did not work for all redheads. Folica: Folica is the only online retailer to sell Nexgen hair fibers. The site offers a discount price on the product. Ebay: Nexgen hair fibers are often auctioned off in bulk on Ebay. Nexgen hair thickening fiber treatments may offer a satisfying solution for people who want thicker hair and can provide a more cost effective alternative to hair replacement. While it may not work for everyone, it can provide a temporary cosmetic solution for thinning hair.